Andy Baxter Bass & Guitars was set up in my own name in 2009, at that time I was running the small business from the living room of my flat in East London. By 2011 the business had outgrown the flat so I set up shop in our first proper showroom in Andrew Weatherall’s recording studio on Scrutton Street in Shoreditch, which allowed me to expand even more. Most recently in 2015 I moved in to the new showroom at 152-154 Hoxton Street, London, N1 6SH. Over the years Andy Baxter Bass & Guitars has established a name as the best place to shop for vintage basses in the UK and recently added vintage 6 string electric & acoustic guitars along with amplification to the inventory. I have always maintained the ‘by appointment only’ approach, as I feel this helps to keep the customers’ buying experience personal as well as allowing the right work/lifestyle balance for myself – that way everyone is happy. What initially led you to set up shop and when did you get started in the guitar side of business? I had been touring around Europe with a band called ‘Battant’ that was signed to Kill The DJ Records from 2006-2008. As that band fell apart I decided it was time to sell some of my small collection to get some money together. With that money I started getting the taste for buying and selling vintage Basses. I contacted an old friend in the USA who was also in the vintage guitar world and I suggested we work together – buying basses in the USA and bringing them into Europe to sell. Obviously when starting out, running the business from home was the most straightforward and cost-effective way to do things, but as I grew the company and started taking on more stock, it was no longer practical to run the business from home. We gradually started picking up a few 6 string electric and acoustic guitars over time, mainly specialising in the electric hollow body guitars, such as Gretsch, Guild and Gibson – ES335s and ES150s and such. It wasn’t until we moved in to Hoxton Street when we were allowed space to hold a great selection of vintage 6 string electric guitars, acoustic guitars and vintage guitar amplification. We already had a great name as being the largest and most reputable stockist of vintage basses in the UK (and across Europe), so jumping in to the 6-string market came naturally. The vintage guitar market is a little more saturated, but Andy Baxter Bass & (and now Guitars) is becoming known as a reputable and knowledgeable dealer. We offer a great variety of brands, including Fender, Gibson, Guild, Gretsch, Martin, Vox, Harmony, Rickenbacker and more… all vintage, of course! What makes you deal specifically in only the higher end vintage basses & guitars and not new instruments? Vintage instruments have always been a passion of mine. It really comes down to personal taste and opinion as to whether vintage Guitars and basses are better than modern versions. I just think that vintage instruments generally do sound better and look cooler. 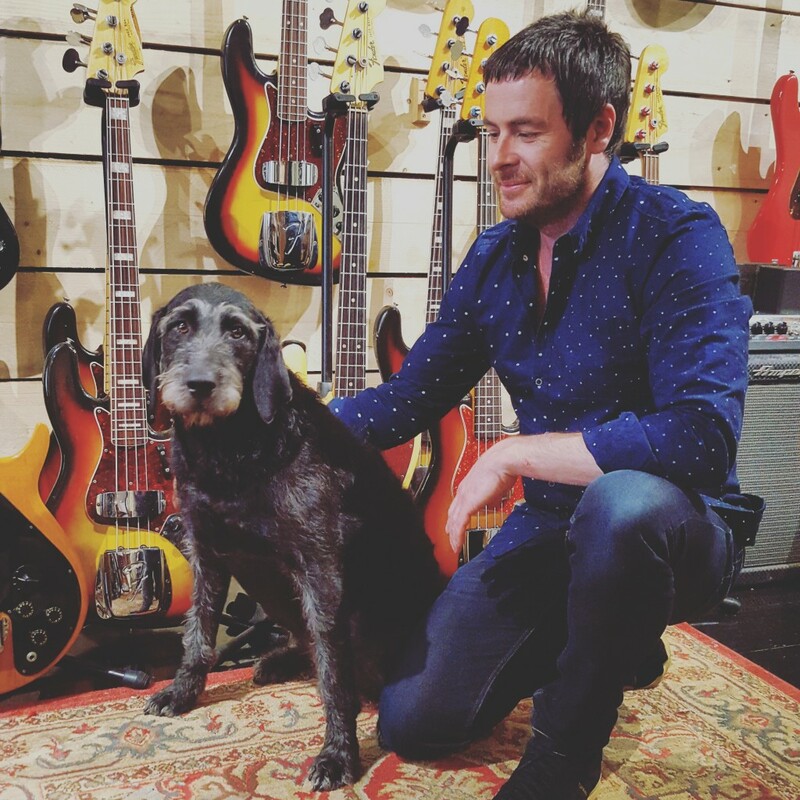 Every single instrument that comes in to Andy Baxter Bass and Guitars is cleaned, set-up and checked over for originality – even down to the solder. A well played in bass or guitar always feels great but sometimes this can be spoilt by poor re-frets and re-finishes. Don’t get me wrong, I do like new guitars and basses and it’s reassuring that manufacturers such as Fender and Gibson are still turning out great quality instruments – even after all this time and after natural changes within the companies. New instruments was never a market I wanted to get into. I never wanted to run a music shop and stock picks, straps, stands and music books. Everyone has to start somewhere, and I’ll always be a supporter of local music shops. I think the manufacturers should do everything they can to support them. What are some of your personal favourite basses & guitars and why? It’s Pre-CBS Fenders that really get me most excited, particularly Jazz Basses. For most vintage guitar collectors and enthusiasts, the pre 1965 (pre-CBS) guitars and basses are considered more desirable than anything Fender has built since as it was when the CBS corporation purchased the company from Leo Fender. More recently I’ve been really getting into Gibson Grabber and Ripper basses. I also really love Hollow-Body basses. Because of my love of The Beatles and The Small Faces, I enjoy playing Hofner and Harmony basses. Are you a player yourself? Yes I’m a bass player first and foremost, but I also play a bit of six-string guitar and I’m also interested in Sitar and Baglama. Is there a general trend to the people who purchase from you? Indeed, I sell a lot of instruments to predominantly men of a certain age. I would say between 45 & 55 who evidently have more disposable income. And then there are the pro musicians who buy vintage basses for studio or gigging work. I also sell to a few rock stars. Mani from The Stone Roses has bough a lot of basses and amps from me. All of the Fender Jazz basses Mani is using at the moment were bought from me. It’s a real pleasure to be dealing with someone who I grew up listening to. The Roses are one of my favourite bands. How has the Internet impacted vintage instrument collecting in 2016? For the music industry as whole, one would assume that the Internet, amongst other new technologies has hindered the growth of the (new) guitar market. Less and less kids are taking up the guitar and bass and are spending more time chasing Pokémon and playing on Facebook. It’s a well educated guess. On the other hand, for the vintage guitar market, the interest has seriously helped. People have access to dealers globally. A lot of my customers are overseas and the majority of my business is internet, telephone and mail-order. I don’t sell directly through my website like an ecommerce store, as people also like to call or email – and I encourage that. But If people are happy to buy over the internet, I will send them as much information about the instrument they’re interested in as I can. The website www.andybaxterbass.com features a wide image gallery of each instrument. I take photos that no other dealer does, detailing every last component – including the wiring, serial number, pots, pick-ups – you name it. We also take things one step further by recording each instrument and uploading the MP3 file to sound cloud, so you can hear the instrument too. Increasingly, we’re now recording each instrument and loading the videos on each product page. This gives customers the best possible representation of the instrument detailing every last little scratch. What advice would you give to somebody who would like to collect fine and vintage instruments? Shop at Andy Baxter Bass & Guitars. Be sure to visit our website often, as our inventory changes regularly. If you’re looking for something specific, contact us and using our guitar-finding service we will track down your heart’s desire, send you pictures with detailed description and personally have the instrument checked out for you. We look forward to finding you the perfect instrument.